With the promise of delicious Turkish food for a low price tag, Emma G recommended that a group of us try the Sultan’s Table after watching the David Strassman show at the Enmore Theatre. I had recently completed a trip to Turkey and I absolutely fell in love with the place. I loved the people, the food and the culture. The food was so spectacular I simply ate my heart out. So I was more than happy to be momentarily whisked back there, even if the food was sourced from the local. While patiently waiting for our table, we soaked in the air of freshly cooked Turkish bread and stood there blatantly eyeballing all of these mouthwatering dishes being rushed out for service. We quickly noticed the mixed dips and decided unanimously right then and there, that we had to order them. Obviously there were other dips that I preferred more than others. I liked the garlicky ones the most, which were the two dips that I spent the most time with hoping that nobody would so much as notice through accurately timed diversions. Clever huh? There were some flavours that I didn’t like but in fairness, some of these flavours were the exact same ones that my friends liked. And for $15 a plate, there was no cause for complaint. The whole eggplant filled with vegetable was nothing to get too excited about. 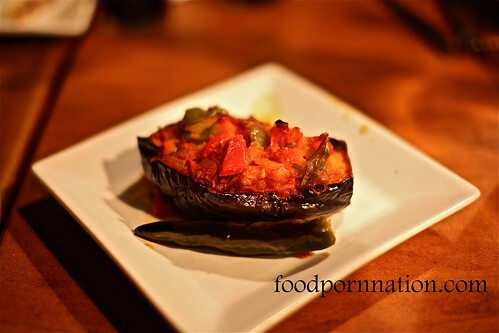 It simply tasted as it sounded, like a whole eggplant with vegetables. This is the binge foodie’s dream. If you’re feeling down in the dumps and you feel like eating your feelings this is what you should be having. 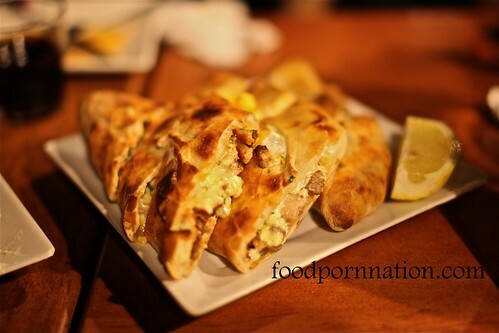 The Harem’s Treat, a pide with chicken, lamb, Turkish sausage, curd beef cheese & egg. OH GOD, positively calorific. It is going straight to my thighs just thinking about it. The pide was prepared fresh and served straight from the oven. Every mouthful was packed full of meaty, cheesy flavours with scrambled egg all wrapped and parcelled up in toasty crusty bready goodness. Simply delicious, fatty and carby. The falafel was really tasty however I noted that after it began to cool, I found it slighty hard and not as fresh. It didn’t exactly stop me from eating it though! 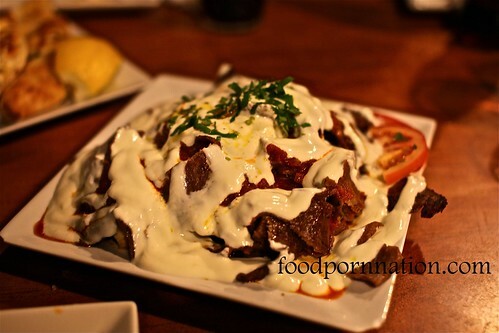 The Iskender set our tongues wagging. It was ever the temptress with its copious amounts of yoghurt drizzled over the silvers of the doner kebab meat mound. Hidden underneath were layers of soaked up pieces of Turkish bread drenched with doner kebab, spicy red sauce and yoghurt flavours. This was definitely the crowd’s saucy favourite. The atmosphere was loud and buzzy.The food was tasty. The servings were a plenty and the service friendly. The meal was dirt cheap and our bill ended up $15 per person including drinks and there was room for leftovers. Note: you must come here starved! We became full halfway through our meal. Even though it wasn’t the most amazing Turkish meal of my life, the food was tasty enough and besides, at that price and at those servings, it is incredible value for money. Welcome to the Sultan’s Table for cheep and cheerful Turkish and generous servings. Beetroot isn’t eaten enough in the states. Yes I have heard this before and I hear Americans hate beetroot in their burgers! I reckon some ne’er-do-gooders in Brooklyn liberally use it, but actually, there’s a restaurant in Portland, OR (if for some reason you end up there) called Clyde Common. They respect beets. Interesting about the peach, eh? Oh, the irony that it appears when you try to make a reservation. Look forward to seeing more about your reviews. I have family in Portland OR, so you never know! I’m dying to go back to America again, such an amazing place. Thanks buildingmybento! Can’t wait to keep writing for you! Ok, so I know this might be a little off topic, but I’m super curious to about the top picture of the mixed dips. The focus draws you to the interesting textures in the photo, which works very well. How did you achieve it? Post? Tilt-shift lens? Just arranging the elements into the same focal distance? No not at all Brent! Happy you asked. It was a while ago, so my memory is a bit hazy. From memory, the editing process really brought out the textures. I just fooled around, until I got what I like. I hope that helps! Dinner at Sultans is one of my regular staples. I just love the food there; from the pide to the dips to the glorious skewered meats. Yummo! woo… i best keep an eye out for you then!